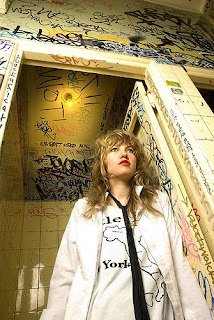 It’s been announced today that the extraordinarily talented Ladyhawke (pictured left following a rather frenzied graffiti attack) is about to return to Australia for an August ‘showcase’ tour. With her single ‘Paris Is Burning’ out on August 25 and her self-titled album out on September 15, the shows are expected to whet audiences appetites, leaving them gasping for more. Her tour will first visit her native New Zealand before taking in dates on the Gold Coast, in Melbourne, North Sydney and Sydney. Tickets for the Melbourne and Sydney ‘Club Mod’ dates (on which she will be joined on the bill by Van She and Tame Impala) go on sale this Thursday July 17.